As you sit in rush hour traffic, yet again, you start to get frustrated. It seems like all you do these days is waste minute after minute sitting idly in your car. You start to ponder what you can do to avoid this situation. Maybe you can convince your boss to let you telecommute. Maybe you should just find a new job closer to home. You the wonder if all cities have this bad of traffic. Maybe you should just move to a completely new city. Then it would be better. Washington D.C. – The state capital is home to a lot of people; including the leader of our country. The drivers here spend an average of 67 hours per year sitting in traffic. If you were wondering, that wastes 32 gallons of gas. Los Angeles – If you live in this metropolitan area, you are probably surprised you are not number one. It’s okay, on this list you don’t want to be on the top. 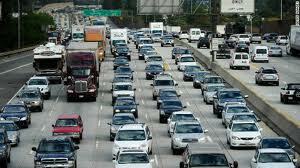 Drivers here waste 61 hours of time annually (and 23 gallons of gas) while sitting in traffic. San Francisco – Wow, two California cities in the top three, that says something: A lot of people live in California. San Fran comes in right behind California, but the drivers waste the same amount of time and gas. New York – There is a reason taxis are so popular in New York. The drivers here waste an average of 59 hours just sitting in their cars each year. Boston – This metropolitan area comes in right behind NYC. Boston drivers are a little luckier, though, only wasting 53 hours in their car. Other top cities include Houston, Atlanta, Chicago, Philadelphia, and Seattle. If you live in one of these top 10 cities, you may want to consider relocating. You could save yourself a lot of time and money by doing so. Or you could just convince your boss that your time is better spent working from home or working a different schedule. Hey, it’s worth a try. You have a lot better things to be doing with your time. If you do end up stuck in rush hour traffic, try to keep your cool. Drive defensively and remember that there is nothing you can do to control the situation. The last thing you want is added stress in your life.